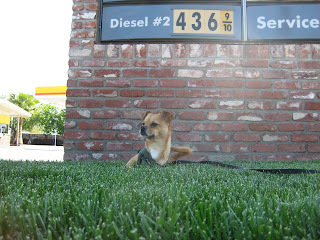 Ever since Ramon was a puppy he has loved laying in the sun, hence the nickname "Ramon del sol." At our first apartment he would drag his pillow out to the deck on warm days. He's found a new favorite spot in our house - the top of the stairs! We have two big windows on our stairs, and his spot gets a ton of sun! 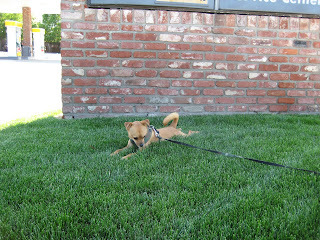 While Ramon does love laying in the sun, he doesn't really enjoy walking in it. 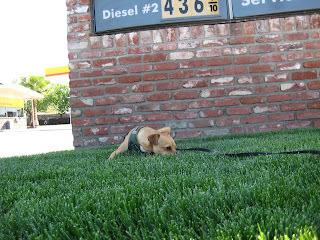 Yesterday, while walking home he decided he wanted a break and hopped onto the cool, shaded grass at the gas station. Granted, we had been walking for a while, but it wasn't *that* hot! After about a five minute break in the shade Ramon let us continue home. He slept very well last night. awwww! he is so darn cute! he looks so much like lily (our female chi). must be a chihuahua thing...we have 3 dog beds out on our patio for the dogs to sun bathe during warm days. they will literally wake up in the morning and walk to the slider and beg to be let out to soak up the sun. so cute!! those pics of ramon are adorable! Ramon always looks so regal! Such a handsome boy. He is a little stud and I know how he loves his walks.